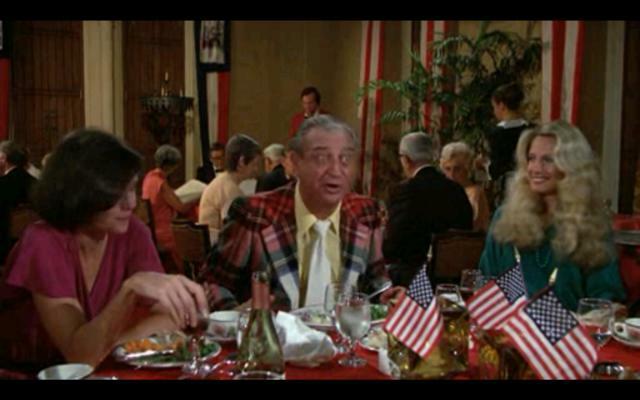 At an elite country club, a young caddy (Michael O’Keefe) hopes to win a college scholarship; meanwhile, the groundskeeper (Bill Murray) pursues a menacing gopher, and the club’s owner (Ted Knight) clashes with an abrasive new member (Rodney Dangerfield). A cult favorite of those who remember it fondly from their youth, Caddyshack is essentially just a vehicle for comedians Bill Murray, Chevy Chase, and Rodney Dangerfield. Murray manages to squeeze in a few funny lines — including his infamous vignette about caddying for the Dalai Lama and being given “total consciousness” in lieu of a tip, leading him to quip, “So, I’ve got that goin’ for me” — but Chase is surprisingly subdued. It’s Dangerfield (in his first major film role) who really stands out as an unbelievably obnoxious real estate developer (“Tell the cook this is low grade dog food… This steak still has marks from where the jockey was hitting it.”) Unfortunately, the film itself is a bit of a pointless mess, and its central protagonist — young caddy O’Keefe — quickly loses our sympathy once he cheats on his loving girlfriend (an appealing Sarah Holcomb) with the resident tart (Cindy Morgan); it’s hard to care much about him — or the film — after this. Caddyshack is really only must-see viewing for diehard fans; all-purpose film fanatics can feel free to skip it (though be sure to check out the truly surreal male synchronized swimming sequence — see still below). No, but fans of Dangerfield or Murray certainly won’t want to miss it. Had they given the gopher a leading role, it might have been a whole different golf game. He’s cute, mute – and not really at the mercy of the writers. Sadly, the perky little fella only gets about 5 minutes of screen time. The synchronized swimming bit – charming though it is – is not exploited beyond 30 seconds. There is one more fun, 30-second bit involving a golfer who foolishly insists on getting his game in just as a thunderstorm is fast approaching – and you know where that goes. Synch swim – 30 sec. Foolish golfer – 30 sec. Allowing 2 more minutes for material others may possibly find amusing, that still leaves one whole hour and thirty minutes of unrelenting, sub-puerile entertainment.